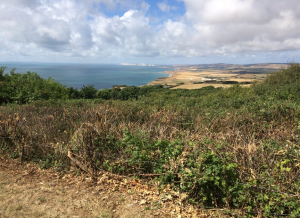 Blackgang Viewpoint car park is situated on A3055 Blackgang road and offers stunning cliff top views of the West Wight. Work has recently been carried out to improve the viewpoint and allow visitors to be able to take in the site’s outstanding beauty. This popular spot acts as an ideal stopping point as it is perfectly situated to explore the surrounding area which is full of natural beauty & fascinating history. A short but brisk uphill walk will lead to St Catherine’s Oratory, or as it is known locally, ‘The Pepperpot’. This unusual building can be dated back to the 14th century and has an information board on the site which details its origins. It also offers fantastic views and is worth the walk. The other side of the car park leads to one of the Isle of Wight’s most scenic coastal paths which runs along the top of Gore cliffs. It provides views of beaches, cliff faces and an aerial view of St. Catherine’s Lighthouse, which is also accessible from the coastal walk. It is here where there have been sightings of peregrine falcons which nest along the cliff faces. Public Transport: public transport access is good. Busses are available from the Viewpoint Car Park Stop (Route 6) outside the site entrance. On foot: There are a number of footpaths including the Coastal Path that converge on or near the site. Walking along the coastal paths on the Gore cliff is an ideal spot for viewing peregrine falcons gliding amongst the jagged rock edges. The birds nest, breed and hunt prey amongst the cliff faces. From the car park, individual or smaller groups of buzzards can often be seen towering and circling the area, scanning for rodents, rabbits and other small prey which they are able to feast on. Rooks are often seen in and around the car park. They nest in the trees growing below the car park. There is a picture board on site which provides an illustrated image of the car park’s view. The image provides details & descriptions of what can be seen from this point.